Terriers return to conference play with a home-and-home series against Providence with the first game at the Friars’ Schneider Arena. Puck drop tonight is at 7 p.m. The Friars, who were the top in the preseason coaches’ poll, will be playing their first regular-season home game. They have a 1-2-1 record, with three of the four games being decided in overtime. Junior Nick Saracino is the top scorer with a 3-1-4 line for the Friars with senior Ross Mauermann and junior Mark Jankowski providing offense. 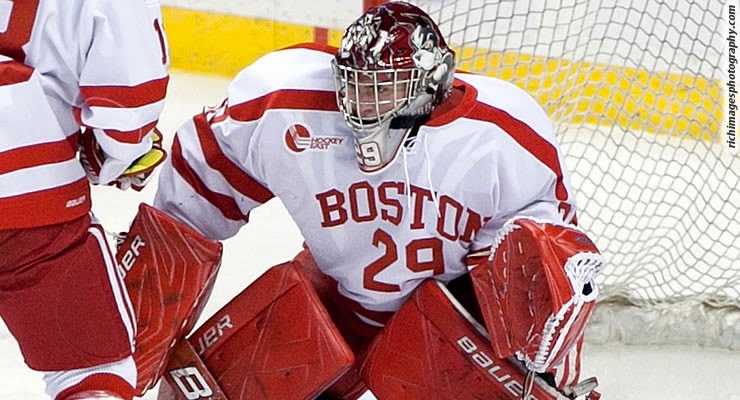 It will be a battle of the tall goalies with PC veteran 6’5” goalie Jon Gillies opposing BU’s 6’6” Matt O’Connor. ►Agganis Arena’s Facebook page offers an interview with senior forward Evan Rodrigues about the series with Providence. 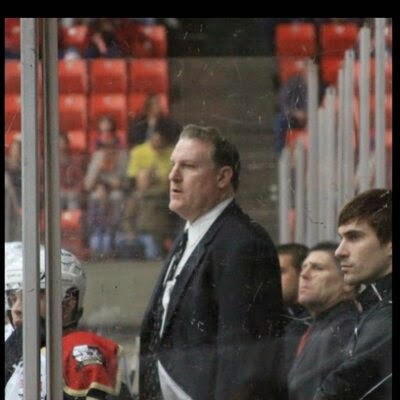 Episode 4 of Inside BU Hockey features Bernie Corbett’s interviews with Head Coach David Quinn, junior goalie and Hockey East Defensive Player of the Week Matt O’Connor and former Terrier All-American, U.S. Olympian and current coach of the ECHL Wheeling Nailers Clark Donatelli (photo). A Rhode Island native, Donatelli was the top goal-scorer on BU's 1985-86 Hockey East Championship squad that also featured Quinn, BU Director of Hockey Operations Scott Young, Terrier Sports Radio analyst Tom Ryan, BU's all-time points leader John Cullen and current Providence women's head coach Bob Deraney. Handful of people asked how many scouts were at Michigan game on Saturday. Just found out that there were over 60. Most we've ever had. “Eighty-four games (in one season) between the Met League and Rockets U18 Midget team later, McAvoy went from off the radar to missing the Met League playoffs for NTDP [evaluation] camp, eventually cracking the final U17 squad.” [He also was named MJHL Offensive Defenseman of the Year with 15-39-54]. Former Terrier David Van der Gulik (photo) was recalled by the Los Angeles Kings from AHL Manchester and played in LA’s 3-0 loss to Pittsburgh. 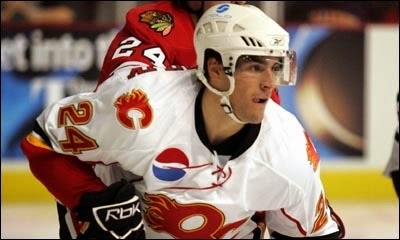 A member of BU’s 2006 Hockey East Champions, he has played in 42 NHL games with Calgary and Colorado. Another recent call-up, David Warsofsky played in the Bruins game against Buffalo. He was one of four defensemen from the 2008-09 national championship team who skated in an NHL game last night, along with Eric Gryba (Ottawa), Kevin Shattenkirk (St. Louis) and Brian Strait (NY Islanders). Shattenkirk assisted on the game-winner last night as the Blues blanked the Ducks, 2-0. Alex Chiasson picked up his third assist of the season in Ottawa's 5-4 shootout loss to Chicago. Last night, Donatelli's Nailers dropped a 3-1 decision to Reading. Wheeling's only goal was the second of the season for former Terrier Sahir Gill. Reading's defense has been bolstered by former BU All-American Colby Cohen, attempting a comeback after two surgeries last season. Agganis Arena brings us another look (video) at the sequence of plays resulting in junior Matt Lane’s deflection of Brandon Hickey’s shot for the game-winner against Michigan. Junior Matt O’Connor’s performance against Michigan State and Michigan—67 of 69 shots saves (.971%) and a 1.00 GAA—earned recognition as the NCAA’s #3 star of the week. College Hockey News’ Joe Merloni examines the resurgent Terriers’ strong start and its infusion of new talent. ESPN’s John Bucciogross takes a look at what makes freshman phenom Jack Eichel (photo-tying goal vs. Michigan) tick and drives him on and off the ice. Wolverine head coach Red Berenson shared his thoughts on Eichel as well as on collegians turned pro early returning to earn their degrees. Speaking of earning degrees, Division 1 college hockey recorded the best graduation success rate among all the NCAA’s men’s sports. 92.1% of those hockey student-athletes entering in 2007 graduated. Hockey Buzz checks in on the Big 10-Hockey East Challenge that has seen defending champion Hockey East carve out a slim lead after the first 12 games. ►Can't make it to Friday's tilt between #6 BU and #9 PC at Schneider Arena? It's being streamed live & for free. 2015 recruit Jordan Greenway registered his eighth assist of the season in the NTDP U18s' 4-1 victory over Muskegon. 2016 recruit Clayton Keller (photo) will compete in the World U-17 Challenge, beginning this Friday in Sarnia and Lambton Shores, Ontario. Team USA plays an exhibition game against Canada White before its first preliminary round game against Sweden on Sunday. 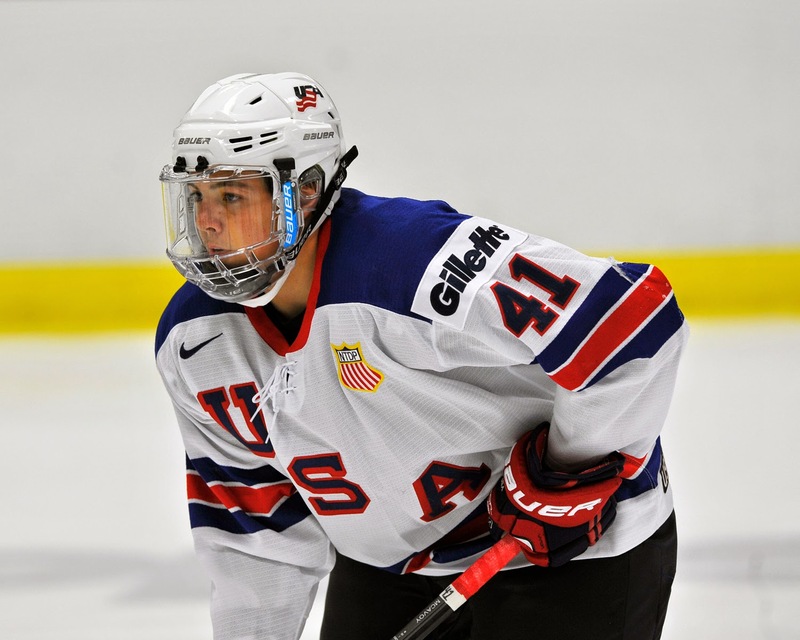 Keller is the top goal scorer (7) and point scorer (13) for the NTDP U17s who make up most of the Team USA roster. Schedule and details. With a spate of injuries on the blueline, the Bruins’ call-ups from the AHL include former Terrier standout David Warsofsky. Last season, he skated in six games with Boston, registering a goal and an assist. Terriers opened their home season with a 3-2 win against Northeastern as junior Rebecca Russo (photo) tallied BU’s final two goals including the game winner midway through the second period. After the Huskies initiated the scoring, senior Shannon Doyle knotted the score at one apiece, assisted by Kayla Tutino and Samantha Sutherland. Russo’s first goal, late in the first, with Rebecca Leslie and Maddie Elia assisting, gave BU its first lead. Just 1:43 later Northeastern tied things at 2-2. Russo’s game-winner, following passes from Leslie and Caroline Campbell, came on a wrister from between the circles. Freshman netminder Erin O’Neill stopped 37 of 39 shots en route to her second victory. ►Terriers remained in 6th place in the national rankings in both the USCHO and USA Today/USA Hockey Magazine polls. ►Senior Shannon Doyle was named to the Hockey East Weekly top performers list after recording two assists and seven blocks in BU’s split with Maine this past weekend.